Summer is approaching, what are some good apps for summer? 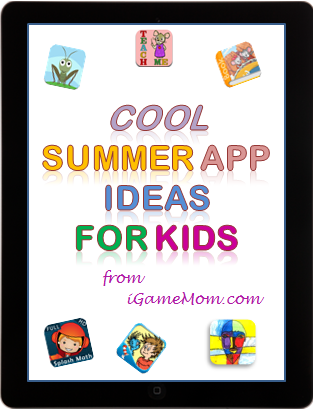 iGameMom has some suggestions on cool summer apps for kids – fun and educational. Kids will be away from school for 2-3 months in the summer. On one hand, you do want them to relax and enjoy some down time; on the other hand, you don’t want them forget study completely. School can take breaks, but learning should never stop. Based on this believe, we picked apps that are educational, and are more fun than some of the academic apps. Hope you find these ideas helpful. Before getting into the apps, have you child-proofed your iPAD / iPhone? In summer, kids will spend more time on the electronic device, so make sure to child-proof the device to keep your child and the device safe! Find out how at “How to child proof iPAD”. Many families will travel during long summer breaks. Travel is a great learning opportunity, and apps can help! There is no school in summer, some families will travel. This is a perfect opportunity to build some geographic knowledge. For kids 6 and older, “Stack the State” is a fun and addictive game. For younger kids, try “Kids Maps”. It is an interactive puzzle game that teaches state facts. If you want to know more about these apps, go to iGameMom’s reviews by clicking on the apps’ names. Like to have more geography apps, we have 10 Best Geography Apps for Kids listed out for you. Where Is My Water and Cut The Rope for kids 6 and older. Fruit Ninja and Toca Doctor for kids 5 and younger. For more fun game apps, check out 10 Free Game Apps that Are Also Educational. Five Little Monkey Collection, Berenstain Bears’ Big Bedtime Book, Mr.Wolf and the Ginger Cupcakes. For kids in upper elementary and middle school: Be Confident in Who You Are, Cool to be Clever, Biography comics. 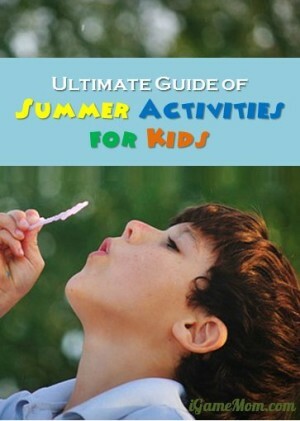 Have you visited 10 Free Book Apps for Preschool Kids and 10 Free Book Apps for School Age Kids? Summer break is usually 3 months long. If the kids don’t touch any reading, math, or Spanish, they will forget what they’ve learned during the school year and will have hard time to catch up in the fall when school starts. It is important to find ways to help them retain what they’ve learned through the summer. Ideally you want to make them fun. Some fun academic apps: Splash Math for Grade 1-5 (Math only), TeachMe for Toddler through Grade 1 (Math and Reading), MindSnacks Spanish. For more educational app ideas, please visit our Best Educational Apps for Kids page, where we have many lists of best apps for kids grouped by age and subjects. App to learn about the stars in the summer sky in your back yard: SkyView and StarWalk. Apps that encourage outdoor exploration: 9 Apps Making Outdoor Science Study Fun. Enjoy the summer and the cool apps. They are all educational too. You’ve got great content, couldn’t find the like button though. Did you remove it? Thanks for following my page. We have similar interests. thanks for stopping by. I can not figure out how to put a liking button – I am on a self-hosted server. Thanks for stopping by. Hope to see you more. Ok, completely butchered words in that last post! How about “I LOVE your site!” and “the” instead of “hte”! Have a great night! Live your site! This is incredible information with all of hte technology out there for us and for our kids! Thanks for sharing! Glad you find it helpful. Please come visit more. I really enjoy our posts! Definitely re-posting this one for my Readers! Great ideas and reviews! My son’s a little older then the grades you tend to write about, but I have nieces who would love some of these sugestions, and use their dad’s iPad all the time! Brilliant site!! SO thrilled to have found you here – my 4 and 6 year old just got new iPads ready for a long trip back to the UK – I have been searching reviews for apps on the web and you are the BEST source I have found – just brilliant. Can’t tell you how happy I am you are here! Thank you! Hope you and your kids will like the apps. I am sure they will! Thanks for visiting my site. Do you have any suggestions for ESL kindergartners? Sorry it took me so long to get back to you. I knew a couple English apps, but none of them are good enough for me to recommend to anyone. However, I just found out Mindsnacks has an English App. I liked their Spanish App very much and had a post about the Spanish app. I would assume the English one is just as good. If you want to know more about their app, here is the link of my review of their Spanish app: https://igamemom.com/2012/05/18/fun-spanish-learning-app-mindsnacks-spanish/ Following that, you should be able to find their English app. Good luck. If you decide to use it, will you let me know how you like it? so I can pass on to other readers. Thanks for your support! I’m a teacher and mum and am really enjoying reading your posts. Thanks! It is good hear a teacher likes the reviews. Thanks for liking my review. As a librarian, wife of a teacher, and mother of two young kids, I think your website is fabulous and will be watching it. I’ve had some trouble getting the facebook link to work, so I’ll just keep checking back here. Thank you Naomi. Other ways to follow are to sign up by email or RSS. Both ways will enable you to receive new posts by email, so you don’t have to remember to come back to check. Email sign up is at the top of the homepage’s left panel. RSS sign up is at the bottom of the left panel. After initial sign up (either way), you will receive a confirmation email. You have to confirm to start receiving post updates. Please let me know if you run into problems. thanks for liking my blog post! Just read yours and some great tips here! Definitely need to check some of these out. Cut the Rope is a huge favourite with everyone in the house. Even the (now) 5 year old loves it. They are also learning some strategy and physics! thank you for these – i’ll definitely check them out! These are great ideas. We are driving from London down to the south of France this summer, which is about 12 hours of two small people trapped in a car… Love the travel apps, but wondered if you’d ever discovered any UK or non US specific ones? Ps thanks so much for all your “likes” on my blog, it’s very much appreciated. Great list! We really like the Maps app, and Google Satellite is another great one for checking out where we are on the road! We’ve been taking road trips the last couple years, as air travel is so expensive! hahah…love the keep the academics up app…. my dd will make a frown when I suggest that, but we always keep up w/ math through the summer…. pays off too, she’s head of her math class. thanks. I used to get summer bridge books for my son, now I found all these cool apps, I don’t have to buy books anymore! Comes handy when you have to travel. You just have to carry a iPAD.